Joe Byrne, Head of Tourism Ireland, North America, Tourism Ireland, Based in New York City, New York, USA. 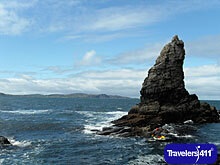 Visit the Travelers411 Directory listing for Tourism Ireland. Joe Byrne, Head of Tourism Ireland, North America, Tourism Ireland was on the May 8, 2011 "Travel with Stephanie Abrams!" Radio Show in hour 1. Visit the Directory for Tourism Ireland.